Impressive presentation; easy to understand; many techniques useful to military, figure and diorama modellers. 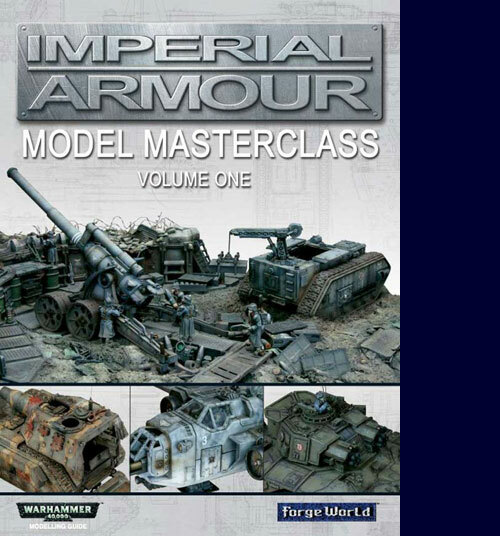 “Imperial Armour Model Masterclass – Volume 1”, is most obviously directed at Warhammer modellers, but there is plenty of reference for we military guys too. I first saw this publication mentioned in a recent issue of Model Military International Magazine, and it impressed me enough to purchase a copy. One look through it and I was very impressed with the excellent quality of the book, which is hard bound, has nice glossy pages and features fantastic photos and tips relevant to all areas of armour modelling. Now I know that the content relates to Warhammer topics, but when you see the excellent work of well known modeller Phil Stutchinkas, who has produced some of what l believe are the best WWII German tanks, you will understand how valuable these techniques are for military, figure and diorama modellers too. The book offers plenty of hints and tips on model building, extra detail, painting, weathering, ground work, and dioramas. There are ample high quality photos to illustrate the text. The result is an easy to follow guide that will be helpful to any level of modeller. Even better, is the fact that most of the models in the book, to me, look like futuristic German vehicles, done in typical colors and camouflage schemes, which will give Wehrmacht modellers some good ideas. This is an excellent book in every respect, from its text to its pictures and layout. It will be well worth military modellers grabbing a copy. The book is available through the Forgeworld site, who provide great service. Thanks to my credit card for review book.